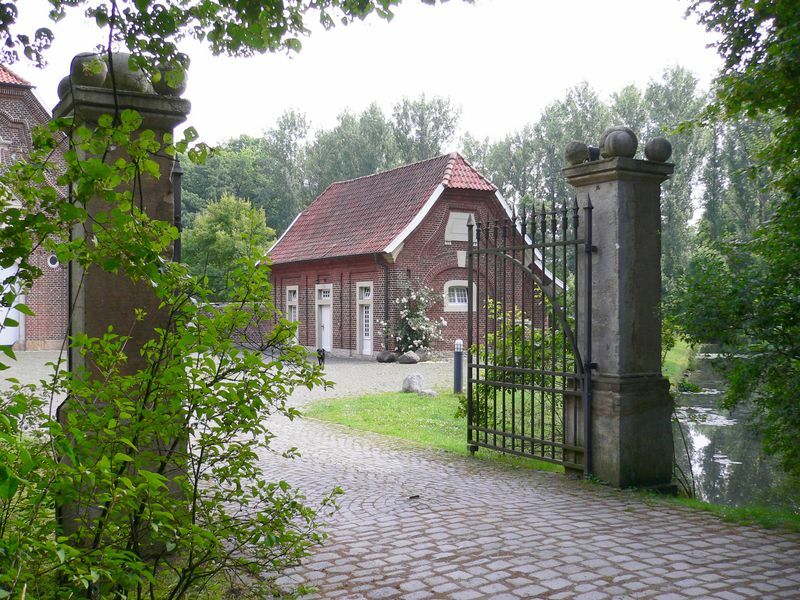 The most poetic castle residence in the Münsterland is surely Haus Hülshoff in Havixbeck. Annette von Droste-Hülshoff, the well-known Westphalian poet, was born here on 12th January 1797. The moated castle and its grounds are located near the town of Münster and are a popular place for outings today. The castle complex was built in typical Westphalian style and is surrounded by a large landscape park divided into several areas. 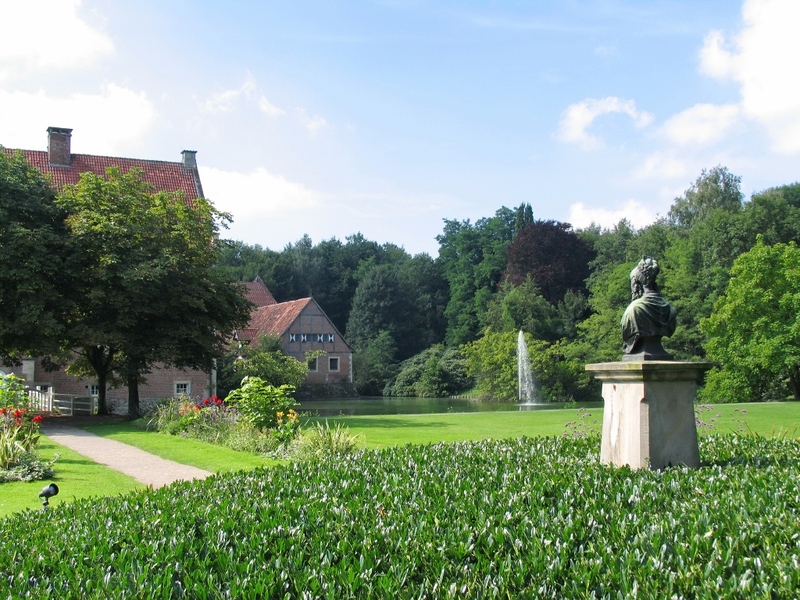 Only a few kilometres away from Burg Hülshoff is Haus Rüschhaus, one of the most elegant farmhouses in Westphalia. The impressive complex is completely surrounded by an artificially created moat and is the former summer residence of Johann Conrad Schlaun, the famous Baroque architect. In 1825, Baron Clemens August von Droste-Hülshoff, the owner of Burg Hülshoff, acquired the estate. A new phase began for Haus Rüschhaus with his poet daughter. After her father’s death, she lived in the idyllic country house from 1826 to 1846 with her mother and her sister Jenny as well as several servants. The artistic embodiment of the Baroque attitude to life which is evident in the building is continued in the two geometrical gardens. In 1983, Schlaun’s plans were used to restore these faithfully to their original 18th-century form. The moated castle and its grounds are located near the town of Münster and are a popular place for outings today. The castle museum can be found in the main house. 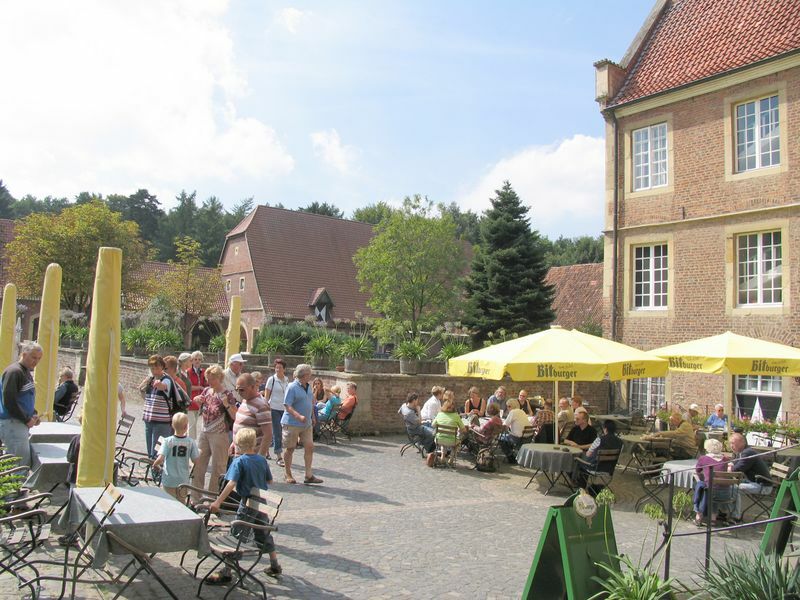 Here visitors can discover points of interest about the castle’s history and, of course, above all about Annette von Droste-Hülshoff’s life. The castle complex was built in typical Westphalian style and is surrounded by a large park which can be subdivided into several areas. The “winter boscage” to the south of the forecastle is known to be the oldest part of the park. This boscage is mainly planted with evergreen trees and shrubs and thus remains an attractive place for a stroll in winter. To the north of the main castle and pond, one finds the rectangular garden island surrounded by a moat. The focal point of the area is formed by a bronze bust of the poet at the centre of an extensively-planted round flowerbed, which is in turn located at the centre of the garden island. A wood of broadleaf trees such as beech, hornbeam, ash, oak and maple adjoins the garden island to the north and forms a “summer boscage”. A long picturesque central path leads through the wood to a garden pavilion dating from 1804. Besides these central areas, a lawn for relaxation and a game reserve can be found at the edge of the park. Annette von Droste-Hülshoff spent her childhood and youth at Burg Hülshoff. 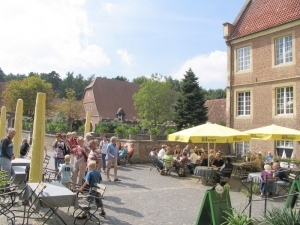 Only a few kilometres away from Burg Hülshoff is Haus Rüschhaus, one of the most elegant farmhouses in Westphalia. The impressive complex is completely surrounded by an artificially created moat and is the former summer residence of Johann Conrad Schlaun, the famous Baroque architect. Before building his townhouse in Münster, Schlaun established Haus Rüschhaus as his country residence from 1745- 1749. While the overall architectural refinement of the estate has the air of a feudal aristocratic residence, the design of the building itself is more like that of a moated rural farmstead. This building was a great achievement of Schlaun’s in that he managed to create a wonderful synthesis of a Westphalian farm and a sophisticated country residence such as was typical in France. The artistic embodiment of the Baroque attitude to life is also evident in the two geometrical gardens. Schlaun’s plans were used in 1983 to restore these faithfully to their 18th-century state. The smaller kitchen garden to the east is divided up by paths in the form of a cross surrounded by a circular path running around the outside. Like numerous other Baroque gardens, there is a sundial at the point where the paths meet. The practical character of this lesser garden is evidenced by low-growing apple and pear trees as well as four vegetable beds, each of which is in the shape of a quarter-circle and is surrounded by a trimmed yew hedge. While these beds were once used intensively for cultivation, they are now planted with grass. The main garden is reached either by following an outside path past the house and passing through another garden gate or directly from the house by way of steps leading from the salon. Here the central symmetrical axis of the whole complex continues past two stylishly planted parterres and ends on the other side of the moat in the wood with a neo-Gothic shrine to Our Lady dating from 1883. Colourful flowerbeds along the central borders and pyramid-shaped yews underline the impressive character of this part of the garden. The expanse of the garden is broadened by a clever feature in the form of two semicircular “exedras” positioned crosswise to the house, each of which has a sandstone bench at its apex. The artistically-shaped garden is divided up by a grid of paths on each side and has a yew hedge as its outermost boundary, giving rise to a total of twelve individual areas surrounded by low boxwood hedges. These were originally tended as beds for fruit, vegetables and herbs, indicating that nearly all the garden was actually used as a kitchen garden. There was another interesting garden outside the moat in the north-west part of the grounds. A plan of the estate from 1791 shows a “boscage” here which could be reached by following a narrow winding path akin to a maze. This area of the garden has since been absorbed by dense woodland and has now disappeared. Baron Clemens August von Droste-Hülshoff, the owner of Burg Hülshoff, acquired the estate in 1825. A new phase began for Haus Rüschhaus with his poet daughter. After her father’s death, she lived in the idyllic country house from 1826 to 1846 with her mother and her sister Jenny as well as several servants. Annette von Droste-Hülshoff wrote her best-known work here, die Judenbuche. At the beginning of the 20th century, the estate was leased and was used for farming only. In 1936, a museum dedicated to the poet was established. In 1979, the Droste-Hülshoff family sold the estate to theLandschaftsverband Westfalen-Lippe (Landscape Association of Westfalen-Lippe) and the town of Münster. Today, Haus Rüschhaus is a museum which recognises the work of the famous Baroque architect Johann Conrad Schlaun and that of the important poet in equal measure. The poet called her study and living room the “snail’s shell”. It remains unchanged to the present day. The museum, park and café/restaurant are open from mid-March to mid-December from 9.30 a.m. – 6 p,m. March/April, November: 11 a.m. 12 noon, 2 p.m., 3 p.m.
May – October: 10 a.m., 11.a.m., 12.00 noon, 2 p.m., 3 p.m., 4 p.m., 5 p.m.
Tours for groups at other times are possible by arrangement. Accessibility: The main paths are suitable for people with limited mobility. Haus Rüschhaus is located in the Nienberge district of Münster. By bus: From Münster main railway station. Bus No. 5 in the direction of Nienberge as far as Haus Rüschhaus bus stop. By car: B 54 road in the direction Steinfurt, signposted from the Münster-Nienberge/Havixbeck exit.